William Himes was born and raised in Michigan, where he attended the University of Michigan in Ann Arbor, receiving his Bachelors and Masters Degrees in Music Education and Performance. Since that time he has appeared as conductor, clinician, and soloist throughout the United States, Canada, Australia, New Zealand, United Kingdom, Switzerland, Japan, Jamaica, Argentina, France, Germany, Norway and Sweden. Well known for his compositions and arrangements, Mr. Himes has more than 175 publications to his credit. These, along with numerous manuscripts are continually featured on international broadcasts and recordings. As conductor of the Chicago Staff Band of The Salvation Army since 1977, he has led this outstanding 36-piece ensemble in many international concert tours including Latin America, Asia, Europe, Australia and New Zealand, the most recent being the May 2011 visit to the United Kingdom. During the 1987 England tour the band performed in the Royal Albert Hall and Buckingham Palace, where Mr. Himes was privileged to meet Her Majesty Queen Elizabeth II. Along with his wife, Linda, Bill is an active Salvationist of the Oakbrook Terrace Corps, where he serves as Bible study teacher, bandsman, songster, pianist and beginning brass teacher. 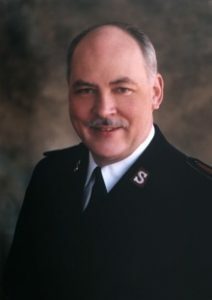 On July 2, 2000, he received The Salvation Army’s highest honor, the Order of the Founder, presented by General John Gowans at the International Millennial Congress in Atlanta, Georgia.